All roads should be leading to Doncaster in the north of England for the weekend of 2nd & 3rd October 2010, when The Budgerigar Society will be celebrating their 85th Anniversary by staging their Annual Club Show at The Dome, Bawtry Road, Doncaster DN4 7PD. Apart from the thousands of top quality birds benched for fanciers from all over the world to admire, there will be a seminar on the Saturday morning, with one of our top and successful fanciers Brian Sweeting as the guest speaker. The seminar will kick off at 10.30 a.m.
Brian’s topic, through a power point presentation, will be “Make ’em Breed”. Tickets are £10 each and include entry to the seminar, light refreshments plus entry to the show on Saturday only. Those who attend the seminar will be invited to watch judging of the Best in Show and other major awards. To help celebrate the Society’s 85th Anniversary, each exhibitor benching 8 or more birds (excluding sales) will receive a suitably inscribed clock memento to mark this milestone occasion of the society. The Saturday evening Gala Dinner will be returning to the Holiday Inn (formally the Moat House) and entertainment will be provided by Barry Cheese, a popular comedian. On Sunday afternoon at 1.00 pm Geoff Capes, assisted by John Alcock, will be on the hammer with the ever popular Auction of Promises – with many quality birds promised from top leading fanciers together with many other superb items and promises. This has been so popular over the years and it generates income towards staging the next show. Throughout the weekend Norman & June Cox, helped by Jackie Fox, will want you to visit them at their great tombola stand with lots and lots of prizes to be won. So go to them and have a go and be one of the winners! Don’t forget also to participate in the Club Show Raffle while you are there. The finale will be when our President Dave Herring takes to the trophy stand to present the array of 91 trophies to their prospective winners. Will you be one of them? 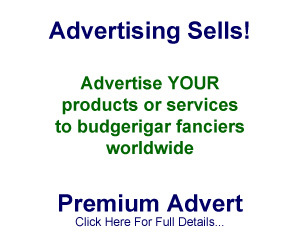 The Budgerigar Society will be presenting Georgian Crystal to the major winners and the Any Age section winners will each receive Georgian Crystal and £30 while £25, £20, £15 & £10 will go for 2nd – 5th Best. The Young Bird section winners will each receive Georgian Crystal and £45 while £35, £30, £25 & £20 will go for 2nd – 5th Best. The junior sections will get Sports Vouchers, a framed certificate and £20 for the winner and £10 & £5 for 2nd & 3rd Best. Apart from all of the above there is an array of Trade Stands at the show for fanciers to be able to stock up with all their needs before the commencement of the breeding season; of course not forgetting the large number of birds that will be in the sales section. Friday between 2.00 – 10.00 p.m.
Saturday between 7.00 – 9.30 a.m.
Saturday between 3.00 – 6.30 p.m.
Sunday between 9.30 a.m. – 4.00 p.m. Admission to the show is £6 per person and a catalogue is £4. All members of the Budgerigar Society will have received their schedules already with the July / August issue of “The Budgerigar”. For other help contact the Show Manager Dave Hislop on +44 (0)1253 855894. For our overseas fanciers getting to Doncaster is easy. There are a large number of accommodation facilities available in Doncaster ranging from Bed & Breakfast, Guest Houses or Hotels and a full list can be obtained from the Doncaster Tourist Information Centre. Come to this wonderful show to join in the activities throughout the weekend, meet your fellow fanciers and just enjoy the amazing atmosphere among like-minded people! I am really looking forward to this year’s show. It promises to be full of wonderful birds and even more colourful people. 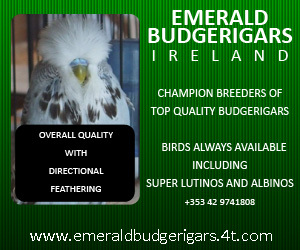 It is a highly recommended weekend for all standards of budgerigar keeping! I would just like to wish all the exhibitors the very best of luck for the weekend, and to all the visitors I hope you have a wonderful time at our premier show. Mick.